Thursday, Jan-10-2019 will be the BBS annual membership dinner at Imperial Garden restaurant on the NE corner of Allen Boulevard and University Avenue in Middleton. The full address is 2039 Allen Blvd, Middleton-WI. Social hour begins at 6:00pm in the bar, followed by dinner at 6:30pm in a private room of the restaurant. You may order from the usual menu and separate checks will be given. Jan-2019 BBS Newsletter (PDF file requires a PDF-Reader). Our normal meetings (2nd Thursday of each month, except for January and July) will resume February-14-2019 (Valentine’s Day) at Olbrich Gardens. Your tropical bonsai are now, of course, inside your house. But tropicals inside a Wisconsin home in the winter pose a range of problems – low light intensity, low humidity, low temperature, and pest infestation are the major ones. Tropical trees have evolved where the daytime temperatures are 80, 90, 100 degrees Fahrenheit or more. In our homes they are lucky to get 70-72 degrees. Just as bad, the relative humidity in most homes is very low (unless you have a whole house humidifier). Last year Matthew G. spoke about vaporizers and humidifiers and ways to raise the relative humidity in your growing area. 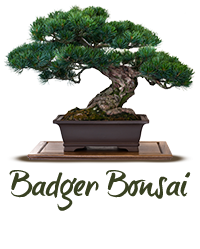 But, light levels are crucial to creating bonsai with short internodes and dense foliage. In my own situation, I have utilized all the windows in my house, and installed supplemental fluoresant lights in my basement growing area. But, I still have many plants that are light starved. Light intensity drops off very quickly away from a window. In diminished light plants get ‘leggy’. The plant produces hormones to elongate the growth. “I know there is light out there somewhere – if I just grow out a little more maybe I can reach it.” Of course, this is not what we are trying to achieve with our bonsai. If you can hook-up supplemental light, your trees will be much happier. I have a Brazilian raintree that I acquired several years ago when an acquaintance no longer wanted it. It is a nice tree with thorns – which can be cut off – and small compound leaves. A few years ago I found a small section of bark – perhaps one by two inches – laying on the soil surface. My assumption was that some squirrel or chipmunk had torn it off. Aside from a big bare spot on the trunk, the tree seemed to be OK. Then, in the last six months large sections of bark have begun separating from the trunk, causing some distress – if not for the tree, then for the tree owner. This is the only Brazilian raintree that I have ever owned so I had no firsthand knowledge of its growth. Was some insect or pathogen causing the bark to split and separate from the trunk? Again, the tree seemed to be okay in all other respects. After searching the internet I discovered that this species has exfoliating bark. So, while this put my mind at ease a bit, I’m not sure I like the looks of it. It appears ‘untidy’. And because it is only (currently) on the lowest, oldest portion of the trunk it looks weird – shaggy bark on the bottom and smooth bark above. “The words Brazilian rain tree bonsai and Jim Moody are frequently spoken in the same breath. The first of these rain trees used as bonsai in the U.S. was grown from seed by the late Jim Moody of Jupiter, FL. The seeds were brought to him in 1978 by his sister-in-law.